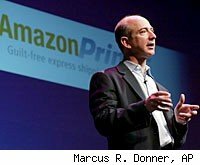 For more than a decade, some smart, successful investors have been telling me that Amazon.com (AMZN) would not succeed, because its business plan was flawed. Meanwhile, the company built its reputation as an online bookseller, added products, and boosted sales. During that time, Amazon's stock was volatile, racing higher through price targets set by the likes of former Wall Street analyst Henry Blodget, and then reeling through declines of more than 50 percent as investors and analysts doubted its ability to grow. Last week, the company's stock reached a record-high after reporting earnings. Has Amazon finally convinced naysayers it's here to stay? Analysts and investors I spoke with this week are saying yes. Amazon increased product choices while keeping inventory low and without losing its focus on superior customer service. A bonus is Amazon's ideological leader, CEO Jeff Bezos, who, like Apple CEO Steve Jobs and Google CEO Eric Schmidt, serves as a chief motivator. Amazon CFO Thomas Szkutak said worldwide sales were up 28 percent over last year, to $5.45 billion, for the most recent quarter. It spent 2.6 percent of its revenue on marketing itself as a one-stop online shop. Its inexpensive shipping costs have led to customers to expect cheap or free shipping, which eliminates the main hurdle for getting consumers to shop online. James Mitchell, a Goldman Sachs analyst, asked Szkutak during Amazon's earnings call last week about North American sales, up23 percent to $2.84 billion from a year ago. Szkutak said customers buying more in each order boosted sales in the most recent quarter. He also pointed out that Amazon has $4 billion in cash, which gives the company a solid foundation and shows that it's building muscle. "Amazon weathered the economic downturn better than traditional retailers," said Benchmark analyst Fred Moran. "As those traditional retailers struggled, Amazon gained share." Amazon also takes risks. Bezos gambled on selling products like turducken, the Segway, and the Kindle, its own e-book reader which has strengthened the Amazon brand and popularized electronic books. Amazon also added same-day shipping in selected cites, including New York and Las Vegas, which Moran says "shows how competitive Amazon is about customer service and shipping." Moran last week upgraded Amazon shares to buy from hold, and set a 12-month price target of $143 a share. "In the midst of a tough retail environment, and while consumers have been challenged, Amazon has grown, and now that we're seeing some consumer relief, Amazon continues becoming more dominant," Moran says. Investor Sandi Lynne says, "Amazon's market value in 1999 exceeded the entire value of all books sold that year -- which meant it was incredibly overpriced." But that was then. Lynne never owned Amazon stock but bought shares before last week's earnings, because she anticipated "outstanding results," she said. Ten years ago, when I reported on the online bookseller for Bloomberg News, Lynne told me Amazon was doomed. "However, it's not about books anymore," she says. "And their distribution is like a well-oiled machine. The U.S. Navy can't get equipment out better than Amazon gets goods out." If you wanted to buy a book published years ago, Lynne says, Barnes & Noble (BKS) and Borders (BGP) say they can get it for you -- but Amazon can ship it to you that day. "There's no slack or delays in their distribution -- that's how good they are," she says. "Not only do they have warehouses around the world, but much of their distribution is direct from the manufacturer." And many overlook the fact that Amazon's Web site has one of the best search engines around, Lynne says. When customers search for an author's name, books appear, but so do CDs, videos on demand, and other products. That added value builds trust and repeat customers. For Amazon, success has led to more success. The larger the company grows, the more customers it attracts. There were many doubers, but it has built the default online mall. Amazon's not merely succeeding -- it's proved its here to stay.